On your blog, Some Sharp Words, you mentioned that you started writing at an early age, and your first book attempt was a mystery called “The Mystery of the Twisted Lane.” I get the impression that you got started writing very young. How old were you when you realized that you had a gift for writing? I was eight when I started writing, though I thought it was something I just played with at first. When I was ten I started noticing the adults were paying attention and then it clicked that this might be more than just something to amuse myself and my friends. Like you, I’ve started writing tons of novels, only to abandon them a few chapters in. Unlike you, however, I have yet to finish a single novel. What changed that finally gave you the kick to go all the way with a story idea? The big difference for me was finding a group of people to encourage and support me. The Kindle I got for Christmas introduced me to the indie revolution. I started talking to some of the authors I was enjoying and before I knew it, I was part of an amazing group. They were so full of advice, tips, tricks and encouragement, I couldn’t help but finish my books. After reading your blog, I have to say that I am very jealous of the fact that you not only write well, but you also have enough artistic talent to design your own book covers, as well as those for several other authors. I can’t even draw proper stick figures! 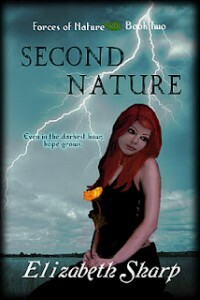 Did you use a model for the covers of “Natural Selection” and “Second Nature,” or is the gorgeous redhead simply a product of your vivid imagination? First of all, thank you very much. I stumbled into art later in life, so wasn’t as sure in it as first as I was the writing. As for my cover model, it is a photograph that I painted over. She is somewhat unique to my books because she is a Deviant Art stock artist, meaning you have to get permission to use their stock on covers. I am honored that the model/photographer agreed to allow me to use her images for my covers. You mention that Halloween is your favorite holiday because you can be anything you want on that day. I’m guessing you also make your own costumes because you enjoy sewing (seriously, getting more jealous by the minute, you have entirely too many talents!) What is the coolest costume you’ve ever worn on Halloween? Hey, now that I’m sufficiently green with envy over all the cool things you can do, how about telling me and my readers something that you CAN’T do. Is there anything you wish you could do well that you just haven’t mastered yet? Anything physical – tennis, dancing, ice skating, gymnastics. I always wanted to be serene and graceful. I’m lucky if I can make it across a parking lot without tripping over the painted lines. I also am convinced I’m the blond they tell the jokes about. I’m not dumb by any stretch of the imagination, but I can sure be a ditz at times. Since “Natural Selection” and “Second Nature” are in the YA genre, tell me, what was your favorite book as a teenager? Are you currently working on your next novel? If so, can you give us a hint what to expect? I am working on the third novel in the series, Better Nature. In it Amelia has to deal with the culmination of events, a very heavy burden of prophecy and an expanding circle of friends to keep safe. As she deals with the constant problems that keep coming her way, she has to figure out who she wants to be with. Before her journey is done, Amelia will uncover a secret so shocking it might change everything for her. Do you have any strange writing quirks? Like always sitting in the same chair, listening to certain music, or sacrificing marshmallow bunnies to your muse? I might have to try sacrificing marshmallow bunnies. If nothing else it could be entertaining. Lol… I prefer to write long hand rather than type on a computer, but I hate typing it later. I discovered a solution to this last summer in the Livescribe pen by Echo. I write my story long hand, plug the pen in and the program coverts it to typed text. Other quirks: I can’t write with a pen that isn’t smooth and bold; I like it to bleed on the page. I have to have certain items with me when I write, whether on my laptop or with the pen: my sparkly koala USB drive, my Scribblins book (where I keep all my notes, inspirational photos, even scene snippets that never made it into the final documents) to take/check my notes as I write. Other than that, I feel writing outside helps me channel Amelia. If she’s being too quiet, I sometimes go to the botanical gardens I used in the climax of the first book. I hear that you are currently expecting. What is the first book you’ve bought, or will buy, for your child’s library? The first book I owned for my baby I owned years before I even knew my husband. It was my favorite as a child. The Monster at the End of this Book, a Little Golden Book featuring Grover. I also have had The Little Engine that Could, another childhood favorite. How can readers stay in touch with you and stalk you around the net? 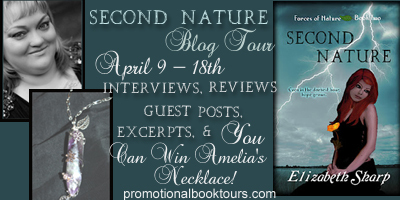 Huge thanks to Elizabeth for doing this interview, and to Promotional Book Tours for setting it up!